Dammit Jim Gien I’m a doctor, not a… wait. Preliminary dialogue for this bit had Pohl attempting to gently remind Gien that he's overstepping his boundaries giving him such an order, only to be pushed into it anyway. Trimmed it back for space, but here's the original extra dialogue. Pohl: Um, technically Gien, I'm not Jin'Sorai, so... you CAN'T really give me an order like that. I mean, just... you know... technically. Gien (glaring): Hmm. Well, tell me this then Tel'Dora; if I were to find your local Whisper and tell her this situation, would they give you a similar order? I don’t believe “thinking” is a good description of his state of mind for the next few hours, at least. Earlier he said he hopes Selkie will be willing to use her powers for their benefit – that implies that she could refuse. Really at this point we have no idea what she would do – Gien might just assume that if she had powers she’d choose to use them – and as far as we know she actually might. Gien can’t really force her right now anyway. She’s on land with the protection of the US government as a citizen, not a refugee. Especially with her being a child. Sure, it’s a social experiment, but the government would not look kindly on Gien anyway. His hands really are tied, behavior of Pohl notwithstanding. … I think Plo Quar knew exactly what she was doing. And I can’t say she was entirely wrong. That said, Selkie, once she learns about everything, may wind up being quite upset at having lost her chance at actual superpowers. But that’s quite frankly something to be settled between Selkie and Plo Quar and maybeTodd and Selkie’s father, assuming that latter worthy is still alive (he’s never mentioned and it sounds like the past few decades have been pretty rough on the population; my suspicion is that he’s dead). I’ve begun thinking that Gien is her father. The kind of controlling father that would use his daughter’s abilities to unleash fury on his enemies. Which is why Plo Quar took Selkie to the surface instead of leaving her with the colony. Not only did she grow up ignorant of her people but she grew up around people who wouldn’t recognize her bow for what it was. I agree with Rens: Plo Quar knew exactly what she was doing. Can’t be Gien. Gien talks about the heritage of “her mother and father”. And he hasn’t bragged about being an echo yet. Also, if Gien was her father, wouldn’t he have tried to get custody of her by now? She still made the choice for Selkie, that’s wrong even if she meant well. But at the same time, you can argue that it’s a parent’s *duty* to make decisions on their child’s behalf when the child is too young yet to understand the implications. Like I said in my response to myself, that’s something Selkie gets to decide if she wants argue it with her mother, and the rest of us – Gien very much included – get to accept her decision. And we don’t know if it was Selkie’s mom or her mom’s sister that did that. Mom’s sister? What did I miss? The second most concerning thing here is that there seems to be a hierarchy among the Sarnothi and that Gien has very high status within it to order Pohl around like that. 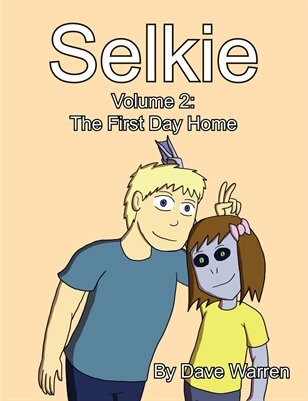 There was something about that previously I think with Pohl on page https://selkiecomic.com/comic/selkie394/ in the notes section. Nothing too specific though. I don’t really agree with the reasoning behind why Gien wants Selkie to have her abilities. No person should be forced to do something, whether it is for the good of the colony or not. Selkie was already ‘forced’ to be with humans as a guinea pig per say, but if her mother’s options were between that and having her used as an object, I can understand why. At the same time, Pohl should probably look into her condition anyway due to medical complications that could occur. I don’t know if an echo/sarnothe has ever been suppressed so young before, but that could cause serious health issues or concerns. That should be the main focus. If it is possible to get her abilities back, if they are indeed gone, that should be up to Selkie and Todd only. It should also be done without any attachments or pressuring for her to have to use her abilities elsewhere. Also with a risk assessment done on any procedure that could occur. I am sort of hoping that Then will step in here and remind Gien that they don’t have claim over Selkie and her life. Also wondering, would it be possible to create a technological version of an echo instead? If they can create something to suppress it, combined with access to human technology, I would think that it would be possible to create. Something like that would be easier than relying on rare abilities from people. I’m not so sure its a clear cut as “no person should be forced to do something”. What if, for example, a deadly plague began sweeping across the Earth. People begin falling sick, and if no cure can be found, the entire human race will be wiped out in a matter of months. Suddenly an amazing discovery is made, a single man who through a fluke of mutation is able to fight of the plague. The only hope of manufacturing a cure in time involves drawing large amounts of his blood. Not enough to kill him mind you, he will still be able to live a long and healthy life after donating. However, this man stubbornly refuses. Perhaps its religious convictions. Perhaps a phobia of needles. Perhaps he is just a selfish misanthrope. Would society at large not be justified in forcing him to give his blood? Would not saving the entire human race be worth the cost of imposing, in this case, temporarily, on the one mans freedoms? Obviously thats an extreme example, but the point is an absolute statement like “No person should be forced to do something…” ignores the possible complexities of the issue. Like many things I believe it has merit as an ideal to aim towards, but I don’t think we should be so inflexible as to assume there might never be circumstances under which such nobles ideals have to be set aside, however reluctantly, for a greater good. In your example I think the answer is clearly that it’s absolutely wrong to force the guy and we should absolutely do it anyway, let’s not pretend otherwise or try sugarcoat it, though. Isn’t “wrong” defined as something that shouldn’t be done though? If its justifiable for it to be done, then doesn’t that mean its no longer wrong? Sometime you only have wrong choices to make, I’d say. Classic debate between two wrongs. Have you ever watched Person of Interest? There’s an episode in Season 4 where they are debating whether to kill this one guy. The guy is a bit sleezy, but not a bad guy, and he’s not doing anything particularly wrong, plus he thinks that the things he’s doing are for the good of all Americans, even if they don’t appreciate it. However, due to information the team cannot give him, they know his actions have the super-likely chance of bringing in an evil supercomputer that will create a dystopia and kill a lot of people. If they kill this one guy — and they’ve eliminated other possibilities such as keeping him prisoner — if they kill him, they stave off that likely future for a later time. If they don’t kill him, the future almost certainly happens right away, and the team will have to go into hiding, and the world will become a lot worse, and people will actually die. Lots of people, more than just this one guy. So is it justifiable to kill this one guy? I’ve explored the idea in my fanfic “Harold’s Nightmare,” because the whole concept of killing one person to save many others is horrifying to Harold for tons of reasons of backstory and characterization. I hope Pohl can fix Selkie. Now I am not saying she be used to help rebuild the home land, its up to her. But what her mother may have done to Selkie is really screwed up. Now I say may, because it is said that Plo Quar has a sister. Now my idea is that Plo Quar is dead, and her sister may have killed her and took a baby Selkie. Why well maybe mom wanted to use Selkie’s power to end the war or something, but her did not ant that so she killed Plo Quar and took Selkie. Like, yeah, there’s an unpleasant tint there, but it comes from a very unpleasant situation – the looming necessity to rebuild. The question here is whether he is pushing around Pohl because he’s such a softie and what he would do if Pohl just said “talk to me like that again and you’ll never see this echo either” or just stood his ground. Like assuming he wants to use Selkie, his authority over her means nothing like it would to Pohl – would he actually have means to force her? considdering that selkie would have echo-powers, i don´t think anyone could force her to do something – gien (and others) would be more along the lines of ‘please, help us rebuild what little is left of our war torn world’. on that matter, i don´t see him quite so ‘evil’ as many others, so yeah he´s kinda making plans *hoping* selkie will help them, but you´ve got to keep in mind, the dude is responsible for ALL still living jin´sorai, he has to keep more then just selkie´s welfare in mind….to quote dumbles: fits for the greater good! Ah, I think you’re missing something important. He’s ordering a doctor to produce the outcome that he wants, even though the doctor is clearly saying it’s probably impossible. And Gien is clearly using threatening behaviour to coerce Pohl. Nothing he’s said suggests that he has any concern for the best interests of an injured child. And echo-powers or not, there’s always a way to make someone do what you want, if you’re more vicious or charismatic, and strong minded, than they are. Pohl is an Echo (if not a master), but he’s clearly not the one in charge of this conversation. At least, that’s the way I read it. pohl, as well as his wife (and many other sarnothi) are merely using that power, echo´s are the one who REALLY have power – gien said earlier how selkie would be their fourth(!) meaning that echo masters are bloody rare. also, while of course people can be coerced, i can´t see selkie give in easily – especially since she can simply return to the surface and her human family and be out of reach. Just a small correction, Pohl himself is an echo. I have the general suspicion the real reason Pohl has gone ‘yes sir’ is because it’s a reasonable thing to ask, even if the guy got pushy about it. It’s quite likely that this is more along the lines of ‘never has been attempted on an eight year old’ than ‘has extensive clinical history of not working’. Yea, his objection wasn’t I don’t wanna do it, it was I can’t do it. It’ll definately be Selkie’s choice once she old enough to make it. I just hope she gets well informed before that comes. Heratige can help define a person, but it should never be the only definition of that person’s life. On top of that, one shouldn’t judge Gien too harshly. He’s one of those people who’re stuck in a particularly crappy situation and is doing his best to make the most of it. I doubt he’d actually wish harm on Selkie considering how few of them there are in the colony and once he calms down, he’ll be fine. And if I’m wrong, may the consequences of his actions be fitting. This outburst aside, Pohl who is an echo himself gets to live a relatively normal life of a doctor – on the surface even. So yea i don’t think his plans for Selkie involve sticking her in a mine or forcefull consciption. I’m definitely judging him harshly. He may not wish harm on Selkie but he’ll cause it. She’s not a tool for him to use! She’s a child. And I doubt he’s going to wait until she’s older. He certainly doesn’t sound like he’s the waiting kind! Especially when he’s asking the impossible of another. Ah, I see. So all of Sarnoth industry is entirely dependent on just three Sarnothi, and the potential fourth has been crippled. Echos are not (just?) badass warriors, but are the one thing keeping their society from slipping back into a pre-industrial state, and the fourth of her kind can’t do the job. I admire Gien for his calm restraint in this situation. I would be much, much more upset. For those who are judging him harshly in the comments, allow me to point out that you are typing on a mass-produced, information-age device, many components of which were produced by machines and shipped across the world. Imagine, if you will, that none of that is true, and every computer in the entire world must be personally assembled by Steve Wozniak, Bill Gates, or Chuck Peddle. Steve Jobs could also assemble computers, but he is dead. Then imagine that you have heard that a fourth guy, Mark Zuckerberg, inherited the rare ability to assemble computers except, no, somebody stuck a bow on his head for three years and now he can’t. There is no other way to make computers, because computers are magic and there are only four wizards in the world, and you just found out that one of those four can’t do magic any more. Like I said: I admire Gien for his calm restraint. Pretty much correct. Just want to clarify something: The reference to three currently existing Echoes are only referring to the Echoes aligned with the surface dwellers (ie: human society and the exiles/refugees no longer living in the city itself). In Sarnoth-proper, where control is held by those who desire preservation of their isolationist policies, there are more Echoes. They’re very important for maintaining stable operations. Okay, so “only three wizards in all of the Great Lakes” isn’t quite as dire as “only three wizards in the entire world”, but it’s still a pretty harsh situation. There are 3 Echoes in or affiliated with the colony. Sarnoth/The Great Lakes have several more, from what Dave just said. While I might agree with the infants, though it could be possible to use human technology even for that, it has been shown that they can live perfectly alright alongside humans without technology. As such, the need for tech and the creation of Sarnoth seems more like it is to keep their culture than necessary for survival. They could live alongside humans without having to be reduced to pre-industrial living. Culture loss and issues with living among other cultures is a common issue for refuges. I find the equivalent to be more that their culture was something that made living on the water in a boat house, but they can’t sustain it with the amount of people anymore (aka like gathering food and water while being on a boat for enough people, etc.). Rather than choose to live on land, they still strive to live on the water since it is their culture. Commendable, but not as desperate as it could be. If it was something like where they literally could not live outside of the water, it would be a bit different, but that isn’t the case. Why I advocated for the adapt option. If echos currently are needed for everything, then alternatives should be found, especially when they are so few. What happens if there is an accident and they all die, or get sick? Back up plans are always good. your right they do need a plane B. But as Agent Brown said in page 372. “There are people out there who can’t accept a thirty-percent melanin variation in members of their own species”. so how do you think people will react to a new species who are just as smart as them?. Perhaps relocate them to a place by freshwater on a ‘government base’ in a US territory island in the Caribbean or Pacific? Easier to monitor interactions with other people and make sure there aren’t fights between species. Why does everyone always read Gien in the worst possible way??? So I get that he wants to use her etc., but it’s worth noting that if she DID become a full Echo, odds are he couldn’t force her to do anything against her will. He just said a few pages ago that he doesn’t intend to make her do anything against her will. He’s upset because Pohl is telling him that Selkie doesn’t have the ability to help thanks to Selkie’s mother. Like I said in my post above: three wizards. Only three wizards in all of Sarnoth, and no mass-production. If your smartphone breaks, how long will you have to wait for Steve Wozniak to personally make you a new one? I bet the waiting line for new smartphones is huge. 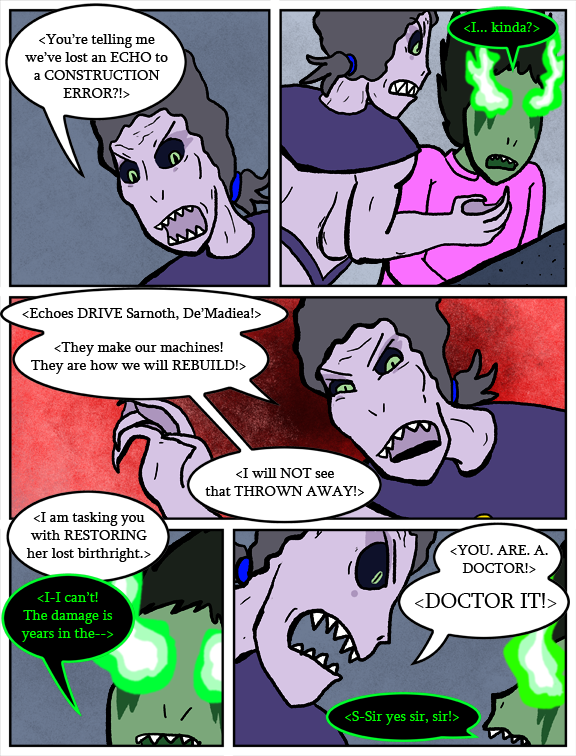 I don’t have the impression that Dr. Pohl is unwilling to cure Selkie, or that he fears it’s dangerous to attempt to. He just doubts that he is capable of doing so after so many years. Gien values the rebuilding of Sarnoth above anything else. I think he would be acting this way even if Selkie wasn’t Jin’Sorai. The fact that she is though probably hits closer to home and he’s taking this as an even greater insult. He values the capabilities over the person. So in this sense, yes he wants to “use” Selkie’s gifts. I think he truly feels that Selkie would be honored and gleeful to assist if she could, given his comment about how she has the SPIRIT of a Jin’Sorai at least. The fact that she doesn’t have the chance as of right now enrages him. The fact that directly or indirectly he can boss around Pohl to try and undo what Plo Quar actually worries me. If he is willing to force other clan members to do his bidding, if he’s ABLE to force them because THIS is the goal… Then Plo Quar very likely did something really, really bad. If Selkie was one of the last chances her people had to rebuild and prosper, it’s no wonder Gien is pissed. But then again, it ultimately should have been Selkie’s choice. I’m actually mad at Plo Quar AND Gien right now. I know we’re not supposed to root for Gien too much since he is clearly antagonizing the protagonists, but we the audience already know his plans and Selkie’s fantasies match up pretty nicely. Yes, Gien is not being nice about how he accomplishes his plan, but if he has his way then Selkie is going to end up becoming Doctor Terrorhammer and then everyone’s happy. Gien doesn’t yet realize it, but he is plotting to have Selkie’s dream come true. Things are obviously not going to be that easy, though. As for Plo Quar, I’m wondering if there aren’t some side-effects to being an Echo on land that haven’t been revealed. The only reason I can think that a (sane) mother would be willing to permanently cripple her child’s super-magic-science powers, would be to ensure her health and safety. So, for some reason, she thought that Selkie without Echo powers would be safer than Selkie with Echo powers. Or somehow it’s a misunderstanding. Like the suppression-ma-jig was actually intended for Plo Quar or something like that. Maybe she’s just not that good at tech, especially if she had to jurryrig it. Would be interesting if she learns what she’s done and her reaction mirrors Gien’s. I was all set to give Gien his complementary copy of the Evil Overlord List and write him off as a meanie who doesn’t care about others at all…and then, seconds ago, I remembered: Dave doesn’t write 1-dimensional villains. So, I’ll be waiting to see where this goes. No, Dave doesn’t write one-dimensional villains – but people can do great evil when they are obsessed with a desperate need or a beguiling ideal. Real villains exist, and they aren’t one-dimensional. I’m fascinated to see where this goes, but I fear Gien is a villain, if a multi-faceted one with his own fears, ideals and duties. At the same time some prople are literaly just that evil so having a few straigt up bad guys is not a fault in a story. Like the principal guy was just plain vile no good qualities – unless his redemption arc is yet to come. Andy & Mikael: Well, of course they exist in like and other stories; I just don’t expect them to turn up here. Even the principal is more “spineless bureaucrat” than evil plotter. Then again, it could be that there’s a first time for everything, and Gien might be the unexcused real deal. Add to that the reaction that most people would have to the news that somebody did something, deliberately or accidentally, that caused brain damage to a child. … Why do I get the sneaking suspicion this is going to end up with Selkie entirely on fire, floating 30 feet in the air, head doing 360s, while chanting in latin with full-blown demon voice? I’m not getting the hate on Gien at this point. He’s mad that a child was maimed for a “construction error”. This is also a man who has lost quite a lot of his clan/family/friends in a war. Every person is important and for one of the only survivors to not have been treated with care immediately – esp. when not approving of her staying on the surface to begin with. I don’t think he’s trying to say ‘she will become powerful and be my workhorse/weaponsmaker/slave’ rather than ‘she was injured for no good reason if she had stayed in the water she would have access to her full potential and we need to fix this’. To me it looks like the reaction if a person worked with children in a hospital/er/refugee camp/etc and sees one with an injury that was totally preventable but is now life-altering (such as becoming blind or deaf – and no, I don’t particularly want to go into if deafness is a disability. It is a culture of it’s own and all, but if someone looses their hearing due to an accident they and those around them will call it a disability at least for a while). Selkie will be able to function fine, but if it’s not fixed then there will be a piece of her missing that she should have had. Add me to the number of people not pinging Gien as evil. Before learning that Selkie’s powers had likely been destroyed, he expressed hope that she would help her people once she Awakened. Clearly he’s well aware that it’s not something he or anyone else can really ‘force’ her into doing and I honestly don’t think he’d try. Now, attempting to *guilt* her into helping if she didn’t freely volunteer to might’ve been a real possibility, especially if a sort of ‘Needs of the Many’ speech were pitched. And I could see that, especially with the observation made somewhere up above that Gien seems to value the preservation of this refugee society and Sarnothi culture more than anything. It’s also important to keep in mind that in the Transcript notes for this pages that Pohl’s clan leader/superior (whoever that might be) is hinted to be one that would also support Gien’s demand/order to ‘doctor it’. So it’s not just Gien who would have a vested interest in Selkie regaining her powers. And so, in light of the above and what we know, I think Gien is largely upset that Pohl has just told him that there’s basically no hope for additional help rebuilding from Selkie. Before Pohl’s news, Gien at least had the hope that Selkie would choose to help one day. And now he’s been told that there’s likely no hope at all. I can’t blame him for being just a bit upset. I imagine he’s also extremely confused and angry as to why Plo Quar, clearly a hero to the remaining Jin’Sorai and possibly many of the sarnothi refugees in general, would have done such a thing to her daughter. And the thing is, we clearly know that Plo Quar intended to *suppress* Selkie’s powers but did she intend to actually destroy them? Until we have a better idea of what she intended and her reasons for it, I’m holding off on being angry at Plo Quar as well. Everyone saying “Plo Quar was right to do this because Gien just wants to use Selkie” or “Plo Quar is horribly evil for maiming Selkie” . . . . PLEASE RE-READ THE PREVIOUS STRIP. Plo Quar, as best Pohl could determine, did not INTEND to permanently remove Selkie’s Echo abilities. Had the device been constructed properly, said abilities would have re-emerged when it was removed (a la Agatha Heterodyne). However, she calibrated it wrong (possibly calibrating it based on her own abilities, rather than her daughter’s) which led to this undesirable outcome. Undesirable by ALL parties, including Plo Quar. Note, also, the author’s note in which Dave states that the proximity trigger was ALSO calibrated wrong, allowing Selkie to get too far away to see/hear the message before it activated. Basically, it appears that Plo Quar threw this together quickly without sufficient time to make sure it worked properly. One wonders why she felt such time pressure. Your comment makes me realize, Lightdefender, that I may have been wrong not to keep that snippet of info in the strip itself. Added in it does help reinforce the “claibrated improperly” angle.